This week's review features a 'political economy of flawed policy-making' section including insights from agricultural protection, Canadian development research, climate change knowledge, 'Northern chauvinism' at global conferences and reflections on 'principled activism' in Sudan. Insights from WhyDev's Peer Coaching pilot project and an interview with a pioneer of distance education also found their way into the review - and there's more to discover! We are very happy that a long-promised journal article on development blogging is finally published in Development in Practice! The article is based primarily on interviews with prominent development bloggers, my professional experience as development blogger and our joint intellectual capabilities. Reflexive engagements: theinternational development bloggingevolution and its challenges is based primarily on interviews with prominent development bloggers (individual 'Thank You' emails are on their way! ), my professional experience as development blogger and our joint intellectual capabilities. The full version of the article can be downloaded here, but there is also an un-gated pre-print version available on Academia.edu. The weekly link review is still a bit off with me getting settled in in Sweden work- and life-wise. So this week's edition comes a bit late/early. This week's theme is 'Africa' with interesting posts about humanitarian fiction and reality in Somalia, misguided German development communication and a fantastic photo essay on Kampala's youth! In other news, a very optimistic article on UNDP's social media potential, a new book on Bono and his brand of celebrity humanitarianism and a great interview with James 'Anti-Politics machine' Ferguson are some of the highlights. But the value of teaching for community colleges, the value of engineers for development and the value of good conferencing are also interesting posts worth your attention! 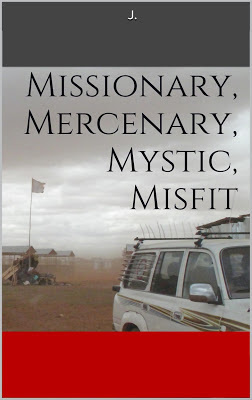 I approached J’s new book Missionary, Mercenary, Mystic, Misfit, the second humanitarian (romance) novel after Disastrous Passion (which I reviewed almost a year ago), with a bit of caution. As much as the pace of the first novel fitted the immediate post-quake relief effort in Haiti which served the purpose of introducing novice aid worker Mary-Anne well, I was skeptical whether the second novel would try to trump the dynamics of high-paced relief effort and high-paced love affair with a French aid worker.